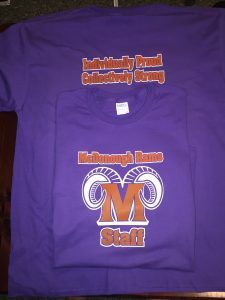 McDonough Rams Staff: Individually Proud, Collectively Strong. These tees and hoodies were made with Port & Company’s Essential tee in purple. The design is F&M Expressions’ Vintage print for that “well-worn” feel of that old tee you love. It’s just like traditional screen printing, only softer.